NEW YORK, Feb. 13, 2019 /PRNewswire/ — Qloo, the leading artificial intelligence platform for culture and taste, has acquired TasteDive, a cultural recommendation engine and social community that helps consumers seamlessly discover new things to watch, read, listen to, and play based on their unique preferences. By joining Qloo, TasteDive will be able to better serve consumers through a deeper catalogue and intelligence, as well as expand into new categories like podcasts and dining. Qloo will benefit from expanded global reach and from TasteDive’s API ecosystem which further powers taste personalization. 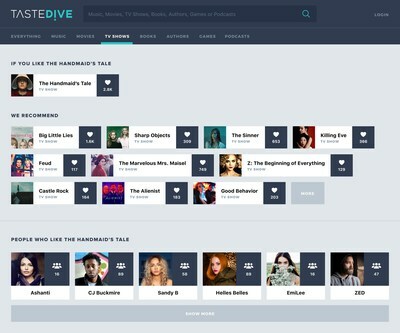 TasteDive helps consumers discover their taste across broad categories of entertainment choices by identifying, matching and making personalized recommendations based on their interests across authors, books, games, music, movies, TV shows and podcasts. Users get on-spot recommendations based on what they like, while registered users are provided with additional features, such as sharing a taste profile, receiving personalized recommendations, and taking part in a global community of like-minded users who can exchange opinions on their favorite items and follow other users’ activities. More than 4.5 million users around the world are actively curating their tastes using TasteDive. More than 6.8 billion recommendations on culture and taste have been provided since the company’s founding. Qloo provides brands with cultural artificial intelligence delivered through a high performance, privacy-centric platform, allowing them to make more informed predictions about what their customers’ tastes might be and how their tastes correlate across over a dozen major categories, including music, film, television, podcasts, dining, nightlife, fashion, consumer products, books and travel. Qloo helps brands solve real-world problems such as driving sales, saving money on media buys, choosing locations and building brands. Its AI platform is the market leader in providing completely anonymized and encrypted consumer taste data and recommendations for leading companies in the tech, entertainment, publishing, retail, travel, hospitality and CPG sectors. Additionally, Qloo serves developers by integrating its API into a wide range of apps to make them smarter. Clients include BMW, Tablet Hotels, IAC, Equinox, Penguin Random House, Campbell’s Soup, Cross Creek Pictures, Samsung and Swarovski. The acquisition will keep the founding TasteDive team in place, maintaining a deep commitment to the TasteDive community and platform. Andrei Oghina, Founder of TasteDive, will remain as Chief Executive Officer and Alex Elias will serve as Chairman. Other terms of the agreement were not disclosed. To experience TasteDive on the web, please go to www.tastedive.com. To learn more about what Qloo can do for marketers, please go to www.qloo.com. Qloo is the leading artificial intelligence platform on culture and taste. The company can predict consumers’ preferences and connect how their tastes correlate across over a dozen major categories, including music, film, television, podcasts, dining, nightlife, fashion, consumer products, books and travel. Its AI platform is the market leader in providing completely anonymized and encrypted consumer taste data and recommendations for leading companies in the tech, entertainment, publishing, retail, travel, hospitality and CPG sectors. By allowing companies to speak more effectively with their target consumers, Qloo helps its customers solve real-world problems such as driving sales, saving money on media buys, choosing locations and building brands. Additionally, Qloo serves developers by integrating its API into a wide range of apps to make them smarter. Qloo combines the latest in machine learning, theoretical research in Neuroaesthetics and one of the largest pipelines of detailed taste data to better inform its customers – and makes all of this intelligence available through an API. Investors in Qloo include Elton John, Leonardo DiCaprio, Cedric the Entertainer, AXA Strategic Ventures, Starwood Hotels founder Barry Sternlicht, Pierre Lagrange, MDC Ventures and All Mobile Fund. Learn more at qloo.com. TasteDive is a cultural discovery platform that helps millions of people find and save new entertainment experiences based on their unique taste. Powered by Qloo, the leading artificial intelligence platform for consumer taste, this easy-to-use platform helps consumers intelligently navigate across broad categories of entertainment and makes personalized recommendations based on their likes and dislikes across authors, books, games, music, movies, TV shows and podcasts as well as connecting them with other users who share their tastes. Learn more at www.tastedive.com.